Hey, we’re Reese & Renee! 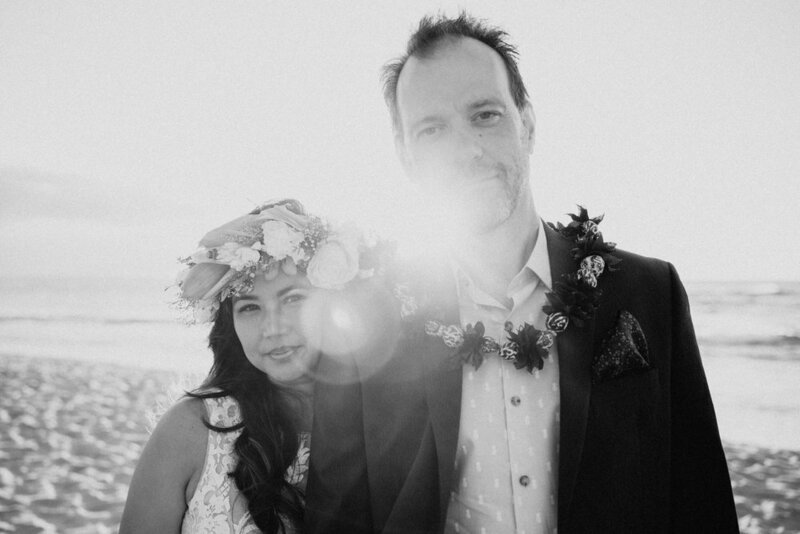 We fell in love when we were 17, started our photo business, got married (five years from the day we met and share the same anniversary as both our parents) and moved to Hawaii! This island is where our life’s greatest adventures take place - from surfing at sunrise to having our first baby - and that’s why we love sharing it with others. So why us? Why should we be invited to photograph such an important day in your lives? We care. We get to know what’s important to you so we can best anticipate and document what matters most on your wedding day. This way, your images are just as meaningful 30 years from now as they are a month after you get married! We blend in. It’s just us and our backpacks. No distracting from your ceremony with tripods, light stands, rolling cases of gear and a five-person team. Most people think we’re guests! We work fast. If you don’t want to pose for photos all day, we’re your people. We’ll get the shots you want without taking too much time away from your celebration where all the fun & moments really happen. We know our stuff. After doing this for five years and photographing hundreds of people, we’ve learned how to anticipate emotions before they happen so you can be fully present on your wedding day, trusting that we’re saving it all for you. “Reese & Renee were the best, from the first initial email they were warm and friendly! They answered a million of my questions and were super helpful. They fit right in and you felt like you’ve known them forever! I chose them because you could feel in their pictures the emotions of that day like you were there - I wanted that for my friends and family who couldn’t make it! "Here's where R+R really shine, they are emotionally invested in their couples. After one e-mail exchange, we were all friends. One year later, I'm confident we'll grow old together. When you look back at your photos, you will remember how you felt. You will relive those moments as if it were the first time and you will feel love. You will cry and feel joy and be forever indebted to Reese and Renee for telling your story when words would fail." “My fiance booked Reese & Renee to take photos of the surprise proposal. We felt a bit awkward at first, but they made it SO easy. They are super friendly and funny and let us enjoy our special moment while documenting in the background. It's been a couple weeks & the images came out beautifully. We're excited to share them with our family & friends! "I can't say enough about Reese & Renee. Together they embody grace, humility, charisma and sheer talent. Reese & Renee spent 5 days with me, my now husband, our families, and closest friends in Maui earlier this year to capture our wedding celebrations. Within the first hour of meeting our extended families on the first day not only did they memorize everyones names, but they also seamlessly integrated into the group. We had people coming up to us throughout our wedding week telling us how much they appreciated and enjoyed Reese & Renee. In fact, it's several months later and people still share the same sentiment with us. If you get a chance to work with Reese & Renee I can guarantee that you will not be disappointed and on top of that you might just walk away with two new friends for life." “Just a short time after we said "I do! ", I realized how truly remarkable Reese & Renee are…When we "hired" Reese & Renee, we had no idea what all was to come. Me, being the naive husband on topics like this for wedding planning, thought that they would just be a couple that took our photographs. Almost immediately, I realized that my expectations were unbelievably shallow. From the first phone call, to that very moment in the meadow, I felt like my wife and I were more prepared for each other than we could have ever been. On top of that, our entire wedding guest list could not believe how amazing their experience was when they interacted with R&R. "Straight away their photo's struck a chord with me - they were raw. You could see real emotion & they were spontaneous & fun. I contacted them via email & I had a response within 24hrs. We came away from one call 100% certain we had found our photographers! Reese & Renee were more than photographers. It was like catching up with old friends. They took the time to come & spend a few hours with us before our wedding & got to know us & our children. This meant a lot as it made us so at ease for our ceremony. The afternoon flew by, before we knew it it was 7pm (3.5hrs after our elopement) & we were having celebratory drinks on the balcony of our bungalow with them. Reese & Renee went over & above to make our day even more amazing than it already was. They made us feel so relaxed & their picture's speak for themselves. We are so happy with our photos & could not recommend them more highly." "Not only did they make Ian and I SO comfortable in front of the camera, they went to great lengths to make sure we were happy, relaxed and having fun on our wedding day. Our families couldn't stop raving over what genuine, professional and all-around great people these two were. They listen, they do AMAZING work and they fit in with the crowd." "R&R do INCREDIBLE photography, plus they are genuine and will become dear friends of yours throughout the process! This duo are natural photographers, talented artists, and will work hard to make you happy happy happy and will surely surpass that. We felt like we were spending time with close friends and never felt uncomfortable while they snapped our sweet memories. Your wedding day is filled with all those you love and intimate moments, and R&R respect, cherish, and understand this time and will capture it so perfectly. If you have the chance to have them be a part of your wedding, count yourself lucky :) R&R are wonderful photographers who are grounded in the stuff that matters and you will feel that as they capture your moments." "Where do we start?? Reese & Renee were beyond amazing! They were so helpful and informative from day one. We are absolutely over the moon with our wedding photos. Thank you for capturing all of our most treasured moments and bringing so much extra happiness and laughter to our big day!!"